That interview gave me the inspiration for this idea. Simply saying “take charge of your own leadership development” might not be enough for a lot of people. Most people wouldn’t know what to do. What if I created a leadership development program that anyone with $100 and a good dose of initiative could complete on their own? So here it is, my first draft. It turned out to be more of a project than I thought it would be, taking up a good part of a rainy Sunday morning in New England and hours of follow-up refinement. Your feedback is welcomed, including pointing out typos, which I am sure there are many. 1. Individuals may freely print and use all materials - that’s why I created it. 2. If you are an internal practitioner or external consultant or coach, you may use and electronically distribute this program to your clients but may not charge for it. You may publish this post in it's entirety on your website or blog (but must inlude all links), or distribute via an email with instructions and a link to this post. 3. While you may add your own suggestions in your instructions, the content of the post cannot be modified without my permission and all links must stay intact. 4. You may print and distribute copies of this post, with embedded links. If you want to print and distribute copies any of the posts I’ve referenced and linked to, please email me (danmccarth@gmail.com) for permission with an explanation on how you’d like to use it. 5. Disclosure: I have no direct affiliation with any of the books or products contained in the program. I am, however, an Amazon affiliate, so when products are purchased though the links in the post I’ll receive a small commission. 1. Buy a “learning journal”. You’ll use this to take notes throughout the program. Read this post for more on learning journals: "Learning Journals for Leadership Development". Cost: $15.00, can be purchased at any office supply store or online at Amazon . 2. Participation in this program is only for serious and committed students of leadership. If you are not willing to invest at least 40 hours of your time, then don’t bother starting. 3. Schedule time. In order for this program to work, you need to treat it like an appointment. Block out 2 hours per week for the next 20 weeks, or more until the program is completed. 4. Decide if you want to complete the program alone or with a partner. The advantage of taking it with a partner, or study group (no more than 4) is to share your insights, coach each other, and keep each other motivated. The disadvantage is it will take some coordination and cooperation, and the introverts may not prefer this method. 5. Create a folder on your computer, Nook, IPad, or use an old fashioned 3-ring binder to keep track of documents, books, feedback, reports, etc… This, and your journal are your course materials. 1. Write a goal statement. Why are you interested in learning more about leadership? What’s your motivation? Think about it, write a draft, reflect, and refine. This should be your vision, your north star, something that will keep you motivated to complete the program. Write it in your journal. 2. Learn from the leadership “gurus”. As you read each book, jot down insights in your journal. You should end up with at least 2 pages of notes per book. Module Two: Learn from role models. Now that you have a foundation of what leadership is all about, it’s time to learn from those leaders that you admire and exemplify the leadership qualities you want to learn more about. 1. The movies. Rent/download two movies from the following list: 20 Best Leadership Movies; Break Out the Popcorn. My personal favorite: Braveheart . Record insights in your journal. (2 movie rental/downloads, $10.00). 3. Real live leaders. Interview three leaders that you admire and feel you could learn from. It could be your old high school or college sports coach, a business leader, a family member, your pastor, or even someone you don’t know but has a reputation for being an outstanding leader. Don’t be shy…. reach out, ask for an hour of their time, ask questions, and take notes. Most people, even those who you think might be hard to contact, are usually flattered and willing to talk about themselves and leadership. That’s part of being a great leader, they usually are willing to give back and teach others. Who knows, one of these role models might end up being a mentor. Cost for three cups of coffee, $10.00. In case you have not caught on (last reminder), yes, record your insights in your journal. At this point in the course you should have about 20 pages of notes. Module Three: Capstone project #1. You’ve learned all about leadership, now it’s time to get some practice. Find an opportunity to lead. It can be a project at work, a little league sports team, a volunteer assignment, planning the neighborhood barbecue, a church committee, anything that gives you the opportunity to set a direction and inspire others to action. If you are completely stumped and can’t think of one, read "10 “Off-the-Job” Leadership Development Opportunities" or purchase CCL’s 88 Assignments for Development in Place ($15.00). Once you’ve had a chance to apply what you’ve learned, it’s time to get feedback. Read "10 Ways to Get More Candid Feedback" (and 5 ways if you really can’t handle the truth) and "18 Tips for Receiving Feedback". the LPI Online 360 assessment. It’s based on the Leadership Challenge (which you have already read) and only cost $130.00. There’s even a free trial version, although I’ve not tried it. 1. Which aspects of leadership resonated with you the most? 2. If you could pick one thing that would make the greatest impact in your ability to lead, what would it be? 3. What have you learned about yourself? 4. What’s your motivation for wanting to be a leader? Has it changed since you started the program? 5. What obstacles are getting in your way? What can you do about them? 6. What are your next steps? 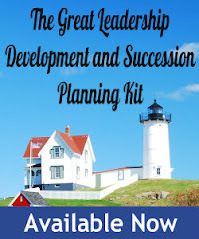 Read "How to Write a Great Individual Development Plan" and create your own plan. You should recognize the process, because you’ve already been following it in a general way. Now’s the time to get more specific – you’re not just learning about leadership, you’re putting a plan together to develop a specific aspects of leadership. Here’s a couple examples to get you started. Module Seven: Capstone project #2: Your leadership “rules”. From studying great leaders, you know that every great leader has a set of guiding leadership principles, or “rules” that they live by. Now it’s time to create your own. In your journal, develop a set of personal leadership “dos and don’ts” that you are willing to commit to live by. These are yours are yours alone, and should incorporate your deeply help values and beliefs. This is the list in which you’ll strive to exemplify and role model. They are not situational, to be bent and modified based on circumstances. For inspiration, try reading the Declaration of Independence. It’s still an amazing document! Congratulations! If you’ve made it this far, you’ve graduated. Now you just need a course certificate and photo. You’ll need to create your own certificate, however, if you mail it to me with a postage paid return envelop, I’d be glad to sign it for you. *Total cost of course materials: $100.00. The value of learning to be a better leader: priceless. What a great post, thank you! In my organization we've been talking a lot lately about "taking charge of your own development," and this really shows how that can be done. As I read through, my mind is whirring with all kinds of ways I'd like to share this with others. Thanks! Please us let know what you come up with. This is such a thoughtful post, Dan. With more free info being available now than anytime in history, we'd be silly not to take charge of our own development. It's not more content we need, it's self directed agendas like yours that provide structure, that we need more of. Thanks. Yes, there sure is a lot of free content out there, but it won't stick without some glue. I wanted to let you know that I thought this post was spot on. I had contacted you a year ago when I was struggling with creating my development plan. I think at the time I wasn't sure which direction to go in. More or less what you have laid out below is what I did. I'm pleased to tell you that I'm now a manager and a lot of the tools you mentioned are invaluable (The 360, capstone project). I enjoy the blog and always get something out of your posts. Keep up the great work! What a great resource and value for your readers! Well done! I have not read it, but Dan Rockwell highly recommended it. That's great to hear, thanks for letting me know! Perfect! What a role model leader. Thanks. This is exactly what I have been looking for. I am working on several aspects of leadership and this will give me just the structure that I need. As far as I'm concerned, this is a public service. I would recommend it to anyone who wants to do a better job of leadership. That's why it was one of my top five blog posts this week. Which Change Model Should You Pick? One More Time: It's the Leadership, Stupid!